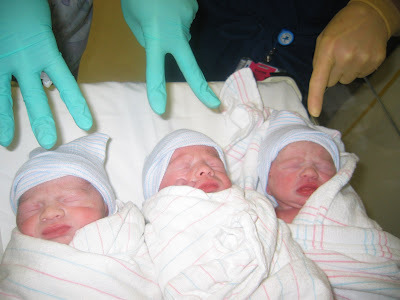 In reverse birth order, Will, Evan and Lily moments after delivery (by stork). This homecoming photo of Will in his car seat really shows how tiny they were. 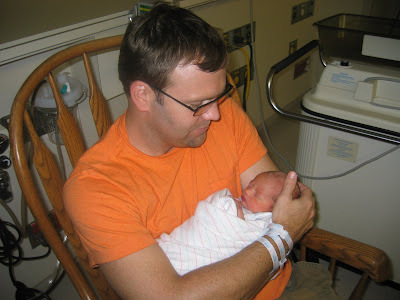 He 'graduated' from the NICU and got to come home first because he was such a robust eater. 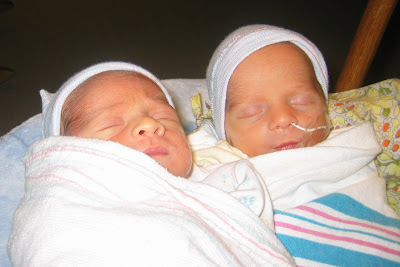 Lily and Evan were able to come home on the same day less than a week later. Happy second birthday to our beloved trio! Evan, Lily and Will we are so proud of you and hope you have a wonderful birthday. Here you are with your new 'shiny red' tricycles from Gramma GG and Grandpa. Dad stayed up late last night putting them together while I baked your train birthday cake. They are just like the bike I got for my second birthday. Evan, you surprised us my automatically pedaling around the deck like a pro. Lily and Will you too quickly got the hang of it too but we will need to add blocks to the pedals so you can really get going. Pancakes and a train birthday cake for breakfast. We had our first break. I knew this would happen sooner or later. I was just hoping for later. Evan broke his humerus this Monday - the long bone in his upper left arm. The good news is that it is a spiral fracture and these typically heal well and relatively quickly. We think he either fell off his playhouse or likely jumped. His favorite movie is Bee Movie and favorite part in the movie is when the 'pollen jocks' take off and go flying. Will, Lily and Evan love that part and like to fly around like bees. This morning we were watching the Today show and a story came on about a base jumper who survived an accident. They were showing clips of his jumps of mountains and of the crash. Lily ran up to the TV and said 'Evan! Evan! Go Evan Go!' each time they showed the jump. But for now a single paint post will have to do. Here are the colors we are using in our house. Painting starts today and I can't wait to see the transformation from institutional white (priming) to something that looks like a real home. Curtains are being made, furniture is on it's way. There will still be plenty to do when we move in but I'm hoping we will have just enough for it to feel like a home. Action at the house and me on the phone in the background with Lisa for my 100th house question, how far apart should my open shelves be spaced?